This is big news. 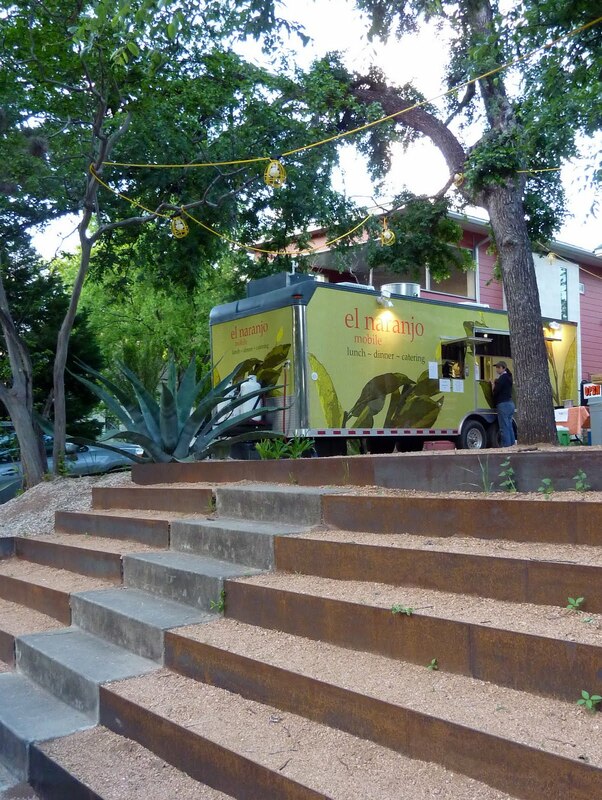 This food truck, El Naranjo, will blow. your. mind. It is, unbelievably, headed up by chef Iliana de la Vega who, until recently, ran what many considered to be the best restaurant in Oaxaca. I cannot be more emphatic in my urging you to stop what you’re doing and go here right now. You will not be disappointed. Andy and I started with the molotes (shown above), cigar-shaped light and lovely fried masa. 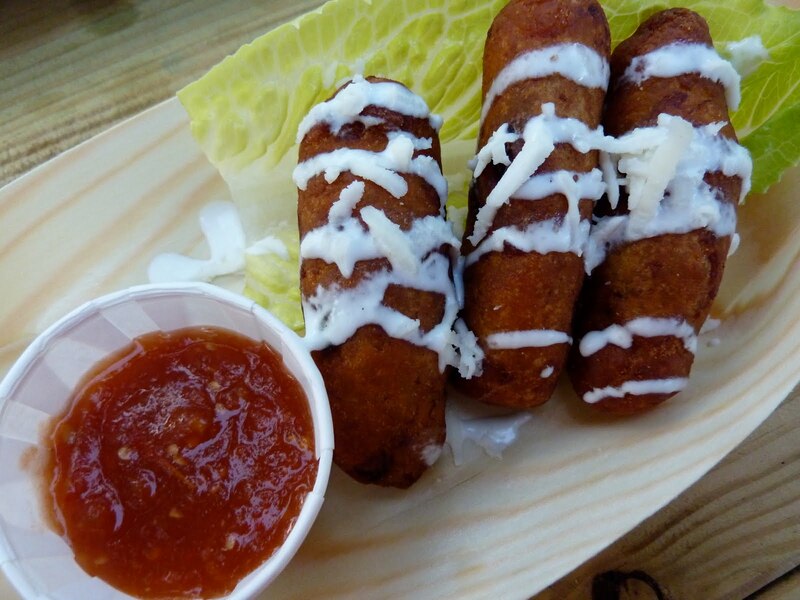 We tried both varieties on order- the oaxaquenos, stuffed with chorizo and potatoes, and the veracruzanos, stuffed with plantains, black beans, and cheese. 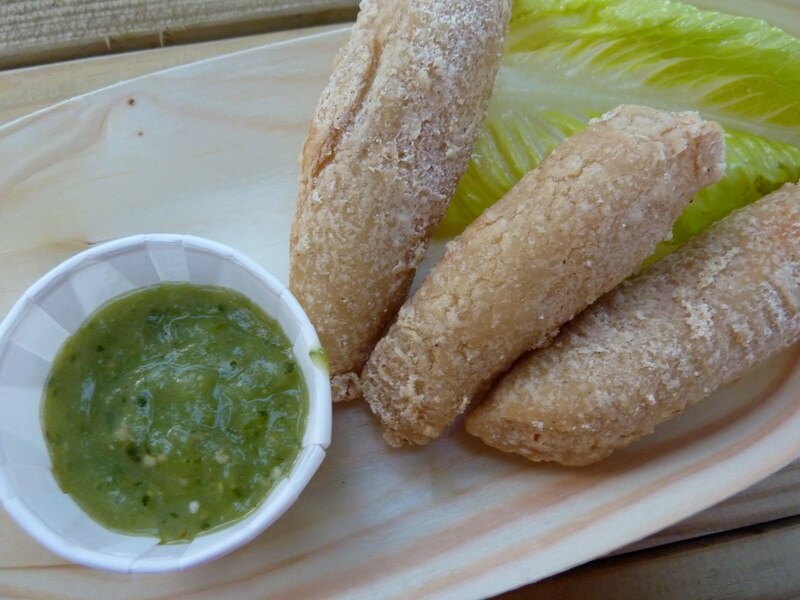 The oaxaquenos were simple and delightful, with that perfect salsa verde, but the molotes veracruzanos were truly extraordinary- the sweet plantains with the cheese and beans combined to make the best. snack. ever. 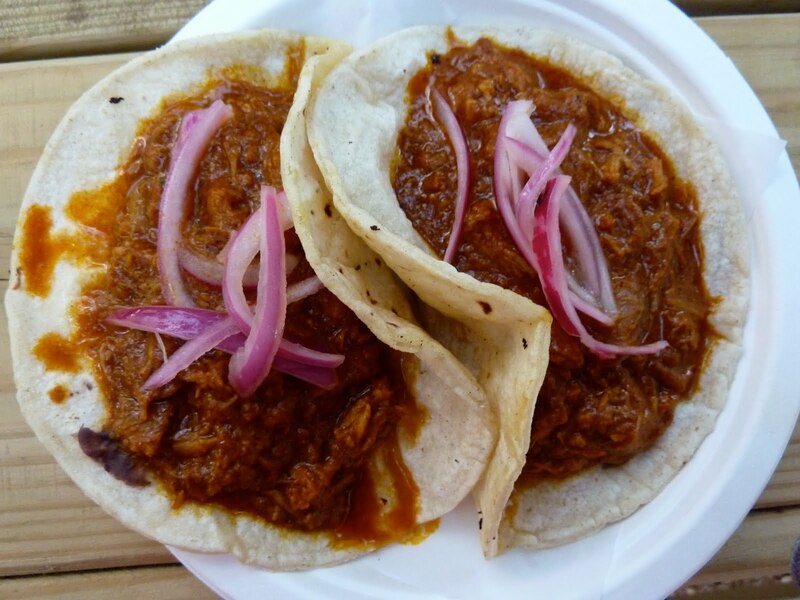 I ordered the cochinita pibil tacos, because I can’t get enough of this stuff. This version, on their lovely tortillas with pickled onions was a soupy, spicy dream. This cochinita somehow managed to be much lighter and tangier than most others I’ve had, while still being flush with clove and cinnamon. A beautiful dish. 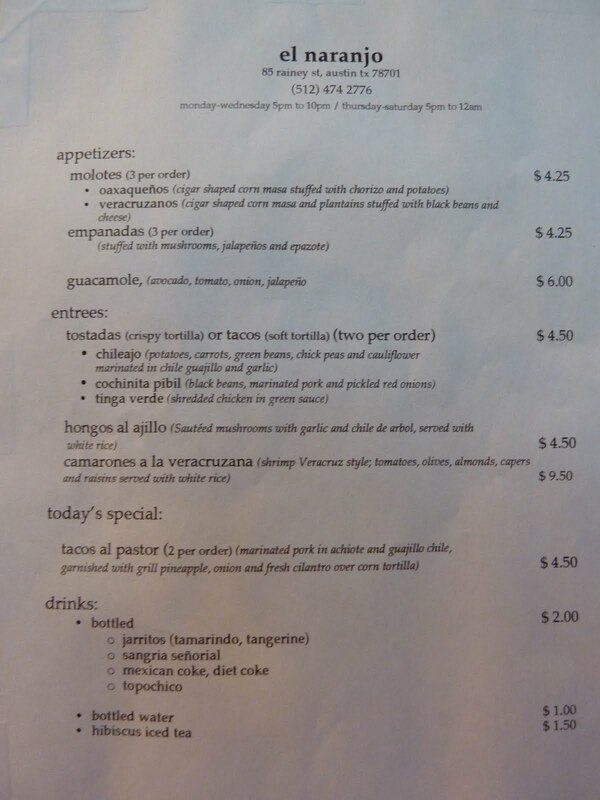 Andy ordered the daily special, the tacos al pastor. 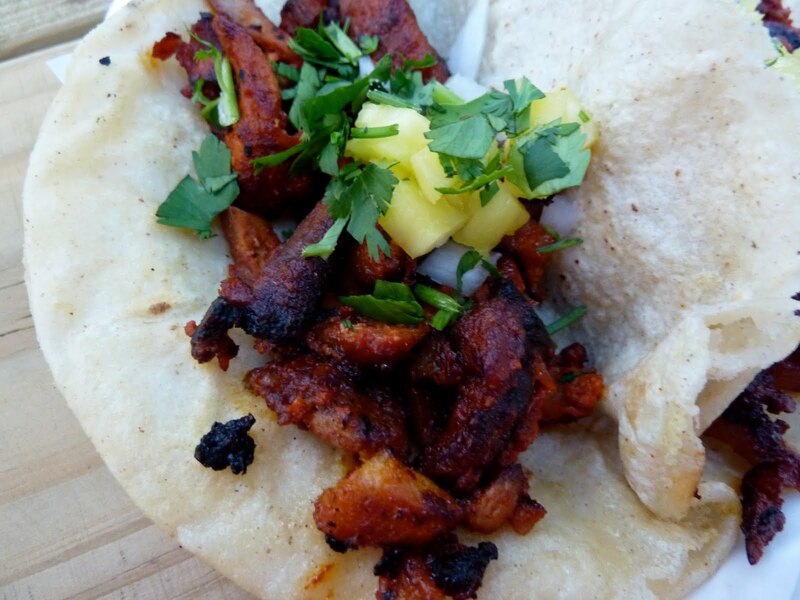 This was, without question, the best al pastor either of us had ever had. Perfectly balanced- the charred pork and fresh pineapple played off one another beautifully. If this is on order when you go, you have got to try it. I’m going to go ahead and say it. Best Mexican food in Austin. Please give it a try and tell me what you think- I can’t wait to go back. Note: this fantastic little spot doesn’t have a website, so I took a picture of today’s menu for you (click to enlarge). I miss Austin. This critique makes me want to come even more. Wish I was there. Yes there is MOLE! But knowing iliana I'm sure that whatever version of the many Oaxcan moles she prepares its probably a two day affair! And just to put in my 2cents worth, Moles are for special occasions, family gatherings, birthdays, quinceanera….. you put love and care into it. So when she does prepare a Mole it will be the best you will ever have had – from a taco truck!